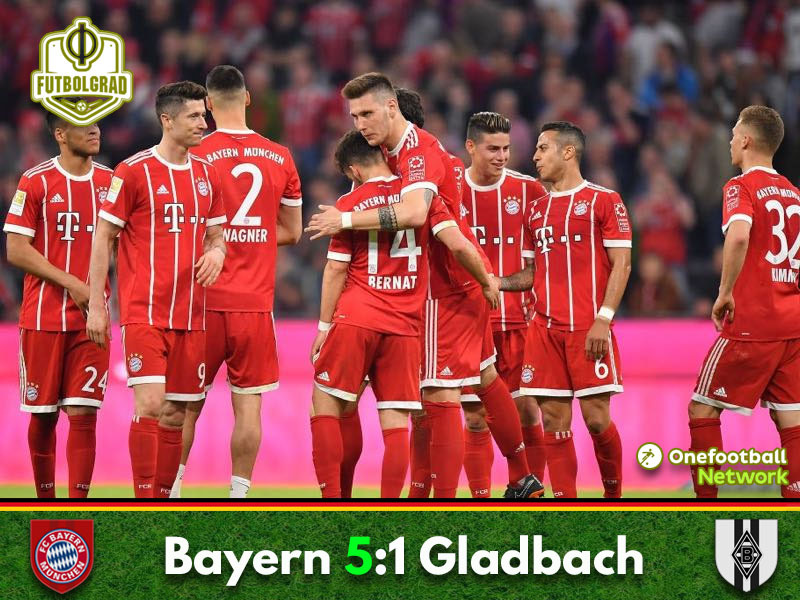 The original Klassiker Bayern v Gladbach ended in another footballing lesson by the Rekordmeister as the Bavarians hammer the Foals to walk away with a 5-1 home victory. Bayern come from behind to win. Lewandowski scores his 28th goal of the season. Ahead of the game Borussia Mönchengladbach head coach Dieter Hecking stressed the importance of not sitting deep against Bayern München. Gladbach, therefore, started aggressively and in the ninth minute, Gladbach took the lead when Josip Drmić managed to find space on the right side broke into the penalty box and then curled the ball past an outstretched Sven Ulreich.Bayern hit back in the 15th minute. Thiago broke forward and lopped the ball into the box where Thomas Müller volleyed the ball acrobatically onto the net, but his shot was wide of the goal. Gladbach were well organised trying to bend but not break against a Bayern side that started to press for the equaliser. In the 32nd minute, Müller, unable to break into the box, unleashed a shot from outside the box that was well handled by Gladbach keeper Yann Sommer. In the 37th minute, Bayern finally found a way through with Müller breaking deep into Gladbach’s box managing a low ball across the goalmouth where Sandro Wagner was waiting to tap the ball home. Just before halftime, in the 41st minute, Wagner doubled his tally. Once again it was Müller, who provided the assist with his high cross finding Wagner in the box and his soft header squeezed past Sommer, the Gladbach keeper mistimed his dive and should have stopped the ball. On balance, Bayern carried a deserved lead into halftime. Bayern remained on fire coming out of the break. In the 51st minute, Bayern had their third. Juan Bernat played a low hard ball in the box where Wagner’s shot was denied, but Thiago jumped on the rebound and scored Bayern’s third. The third goal settled it for Bayern. The Rekordmeister now held possession playing the ball around the box looking for a fourth goal. That goal arrived in the 68th minute. David Alaba created space by moving from the left to the right on the edge of the box then hit the ball hard with his weaker right foot, and Sommer had no chance to stop the ball. It was a typical dominant Bayern performance. 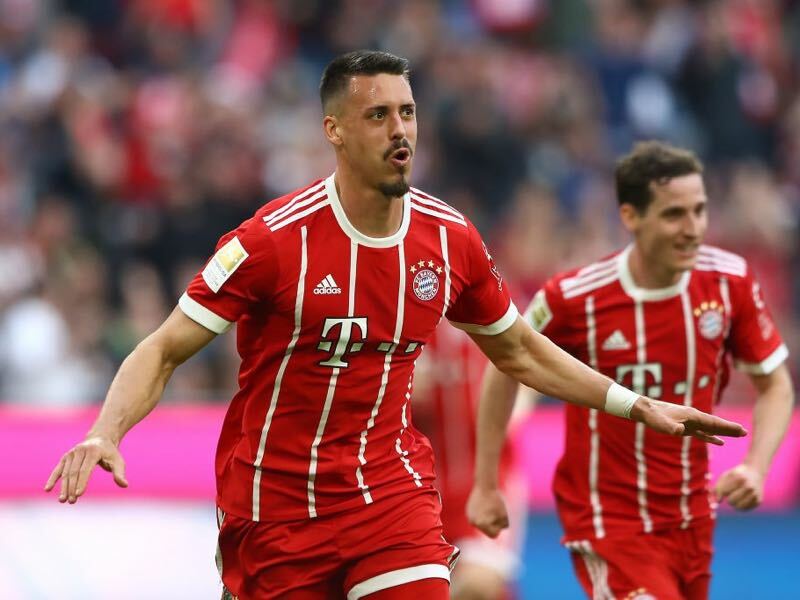 Having come on for Sandro Wagner, Robert Lewandowski did not take long to make his introduction scoring with a low drive from inside the penalty box after a brilliant assist by Joshua Kimmich. It was the last goal of the game as Bayern eased off their onslaught in the last ten minutes to hand Gladbach a heavy defeat. Sandro Wagner scored two goals in the first half to turn the result around. For the first time in his career, Wagner has scored in four Bundesliga games in a row. In ten Bundesliga games with Bayern Wagner has now scored seven goals and with plenty of playing time in Munich is reinforcing the notion that moving from Hoffenheim to Bayern in the winter was the right move for the 30-year-old striker. Under Pep Guardiola and Carlo Ancelotti Bayern in the last few years would ease off in the league after wrapping up the title. That was not the case under Jupp Heynckes in 2012/13, and it now appears that Bayern will also stay focused this time around to keep up the focus within the squad. Bayern still want to win the Champions League, and the DFB Pokal and Heynckes believes that a lack of focus could jeopardise aspirations in the other competitions – that will certainly not be the case this season as the performance against Gladbach on Saturday highlighted. David Alaba scored his 18th Bundesliga goal today and his first with his right foot. For the first time in his career, Sandro Wagner has scored in four successive Bundesliga games. With a passing accuracy of 93.9%, Bayern set a new Bundesliga record since the start of the statistical data in 2004/05.